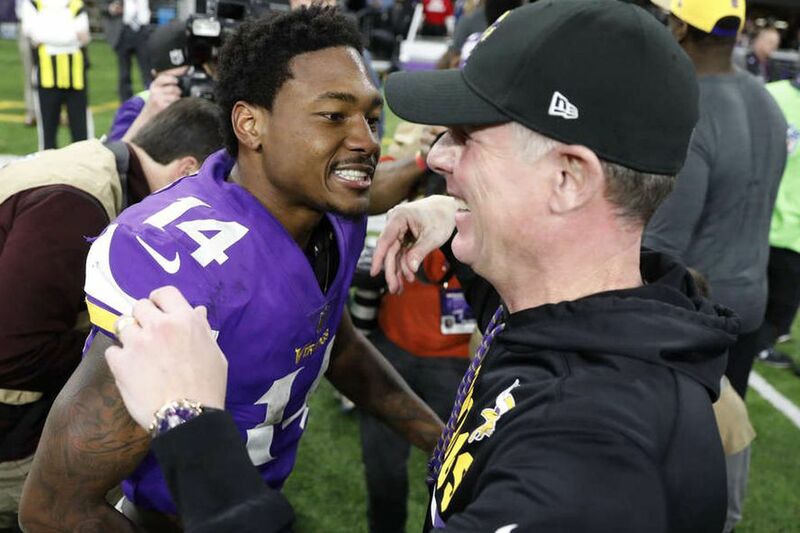 Minnesota Vikings wide receiver Stefon Diggs (14) celebrates with offensive coordinator Pat Shurmur following a 29-24 win over the New Orleans Saints in an NFL divisional football playoff game in Minneapolis on Sunday. EDEN PRAIRIE, Minn. – Pat Shurmur had just been informed the Pro Football Writers of America voted him this season's NFL's assistant coach of the year, a nice prize that has been won by a lot of terrific coaches, including his current boss, Mike Zimmer. In another week and another year, that kind of news might have dominated the rest of his conversation with the media. Not this week and not this year. Not when so many enormous things lie ahead for the Minnesota Vikings offensive coordinator, starting but definitely not ending with Sunday's NFC championship game against the Eagles at Lincoln Financial Field. Philadelphia, of course, is the place where Shurmur spent 13 years of his career — 10 as an assistant to Andy Reid and three others as Chip Kelly's offensive coordinator — so this was going to be an exciting week regardless. "This is my sixth NFC championship game and five of them were with the Eagles," Shurmur said. "It's going to be a great environment for a game." Shurmur, of course, was the offensive coordinator the last season the Eagles went to the playoffs before this one. He was there when an unknown named Nick Foles replaced Michael Vick and threw 27 touchdowns and two interceptions in 2013. Based on his own experience, Shurmur is not of the mindset held by so many in Philadelphia that the Eagles cannot win with Foles. "I've seen the best of Nick … and I know what he brings to the table," Shurmur said. "He's an outstanding player. I think everybody knows Carson [Wentz] is going to be back next year, but I'm not surprised by Nick playing good games." Regardless of what happens Sunday at the Linc, the future will be fascinating for Shurmur. Win and the Vikings will return to Minnesota and prepare to become the first team to ever play a Super Bowl in their home stadium. Lose and Shurmur will soon find himself 95 miles up the New Jersey Turnpike at the New York Giants' headquarters in East Rutherford, N.J. Like so many other winners of the PFWA assistant coach of the year award, he will not get a chance to repeat. Shurmur's new job is going to be as head coach of the Giants, one of the Eagles' most heated and hated rivals. Shurmur, 52, could not specifically address his new role, which will be his third head-coaching job in the NFL if you count his one game as an interim coach for the Eagles two seasons ago. Shurmur did, however, take time to answer questions from a couple of New York-area writers and one from Philadelphia following the Vikings' practice Thursday morning. "They've won through the years," Shurmur said when asked why he considered the Giants an iconic franchise. "When I think of them, I just have great respect for what they've accomplished. The great players, the Lombardi Trophies – it's iconic in a lot of ways. I know when I was with the Eagles and we jumped on the bus and rode up the turnpike, I always looked forward to competing against them." Now, he will be on the other side of one of the NFL's best rivalries. Oddly, Shurmur's only game as the Eagles' interim coach came against the Giants at MetLife Stadium after Chip Kelly was fired with one game remaining in the 2015-16 season. He won, 35-30, and later interviewed for the Eagles' vacant job that went to Doug Pederson. Shurmur said there were no regrets or hard feelings when the Eagles did not hire him. He was fine taking the job as the tight ends coach in Minnesota, even though it seemed to be a career step in the wrong direction. "When we left, and my family was great about it, we were on to our new adventure," Shurmur said. "I knew we would end up in a really good place. We always feel like this new place is going to be better than our last. And we came up here and we loved Minnesota. This is a breath of fresh air. Sometimes it's cold air, but it's fresh. I've really enjoyed working here, and I've learned a lot about everything football from our general manager [Rick Spielman] and our coach [Zimmer]." After seven games last season, Shurmur was elevated to the position of offensive coordinator again when Norv Turner suddenly resigned. His star was on the rise again and it shot through the stratosphere this season when the Vikings had to turn to journeyman backup quarterback Case Keenum early in the year and still finished 10th in the NFL in scoring while going 14-3. Now there is at least one more order of business for Shurmur to perform in Minnesota. He will be back in Philadelphia Sunday for another NFC championship game.